On 14-15-16 October CADWAGO organised the final Governance learning event in Sassari, Italy. It was hosted by NRD at the University of Sassari at the MUSA. 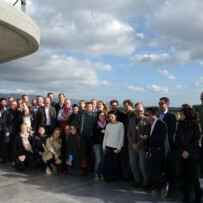 The Sardinian workshop was the last of CADWAGO’s international learning events of relevance to water governance, policy and practice in public, private and civic spheres. It was run as an inquiry that included presentations on the projects findings, contributions from stakeholders with whom CADWAGO has worked together, a visit to the Arborea case study, and the participation in a traditional reconciliation event “La Rasgioni”. During the time together we critically reflected on what we have learnt both through the project and the event. We would like to thank the participants, who shared their knowledge and experiences in climate change adaptation and water governance, and their organisations for enabling their participation. A full report of the discussions and activities is available CADWAGO final learning event report. A musical start: “Music Acqua” concert: musical variations on climate (blogpost). You can listen to the full concert with English sub titles or look at a video summary in the local press. UK – Damian Crilley (EA), Kathy Hughes (WWF), Richard Cole (DEFRA) presented the work they had done as part of CADWAGO in the newly set up Catchment Group to facilitate co-learning on how to implement river basin management in England using a systemic water governance approach. Groups looked at the Arborea case study through their own lenses and were invited to participate in a structured process of inquiry, entertainment, co-learning and reflection with local stakeholders. The field visit to Arborea district included a visit to the pumping station and we participated in “La Rasgioni” – The Water Court (blogpost). This was a live debate between the institutions and the farmers and fishermen in the area. In preparation statements of witnesses (video) were prepared which started and ended with a song about the local context: La canzone di Arborea. The sessions on the 16th of October are described in the report and included reflections on the field trip, mapping towards actions, and going from individual action to collective change.